Styrofoam “Blue” extruded polystyrene products deliver high levels of compressive strength, thermal requirements and susntainabilty, throughout the lifetime of the building. Available in a number of different grades, thickness and sizes, advice and support is available from the staff at Tennants. So why use Styrofoam over foil backed boards? 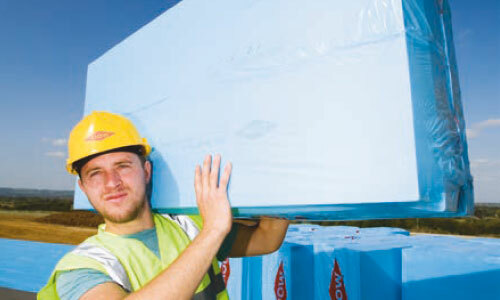 Styrofoam, or “the Blue insulation” as it is often refereed to, is a closed cell product, meaning it can with stand very high loading weights and has a very low wayter absorptoion, menaing it has a natural resistance to rain, snow, frost & water vapour. This makes it ideal for flat & Inverted roofs & cold store facilities were heaving loading weights are required for Arctic vehicle & fork lift trucks. At Tennants we have completed many of these projects in conjunction with DOW so have the Knowledge & experience to answer any questions you may have.